Sea-Bird MicroCAT 05434 5 m None. Star-Oddi minilogger 02842 7.5 m Comparisons performed against the other instruments present at this site found an offset of 0.1° on deployment and 0.05° on recovery. Sea-Bird MicroCAT 04966 10 m None. Star-Oddi minilogger 02843 15 m None. Teledyne RDI 600 kHz ADCP 2390 Located on seabed To correct for the magnetic declination (difference between magnetic north and true north) latitude values were changed by -3.2783°. All latitude values were modified by +1.4312° to correct for the compass error. Sea-Bird MicroCAT 02081 5 m None. Star-Oddi minilogger 02844 7.5 m A temperature offset of -0.03°C was found when these data were compared with the data recorded by the Sea-Bird MicroCATs also present at this site. An offset correction of +0.03°C has been applied to these data. Sea-Bird MicroCAT 05790 10 m None. Star-Oddi minilogger 02852 15 m A temperature offset of -0.03°C was found when these data were compared with the data recorded by the Sea-Bird MicroCATs also present at this site. An offset correction of +0.03°C has been applied to these data. The Star-Oddi Starmon mini is a compact microprocessor-controlled temperature recorder with electronics and probe housed in a strong waterproof cylinder made of either plastic or titanium. 350000 measurements, although memory size can optionally be increased to 524000 or 699000 measurements. Temperature readings are stored in non-volatile Electrically Erasable Programmable Read Only Memory (EEPROM). -2 °C to +40 °C with outside ranges available at request. The average resolution is 0.013 °C, and the measuring accuracy is +/-0.05 °C. Downloaded via PC interface box. Connects to a computer via a RS-232C standard serial interface. A 3.6 V lithium battery with a life of 5 years for a sampling interval of 10 minutes or greater. For more information please see the manufacturers specification sheet. The following procedures were carried out before the data were supplied to BODC. Data were downloaded from the instrument logger, and factory calibrations were applied to the temperature channel. The data was declared good quality and no corrections were applied. Series with consistent offsets, spikes or periods of bad data were edited to correct for these issues. Spikes and periods of unrealistic values were converted to NaN values. The series was marked as 'use with caution', if there were problems which the Originator was unable to correct, or if it was unclear whether there was a problem with the data. If the quality of the data from a series was extremely poor, then the Originator recommended that the data should not be used. A full description of the results of these quality checks can be found in the relevant Originator's data processing comments document. 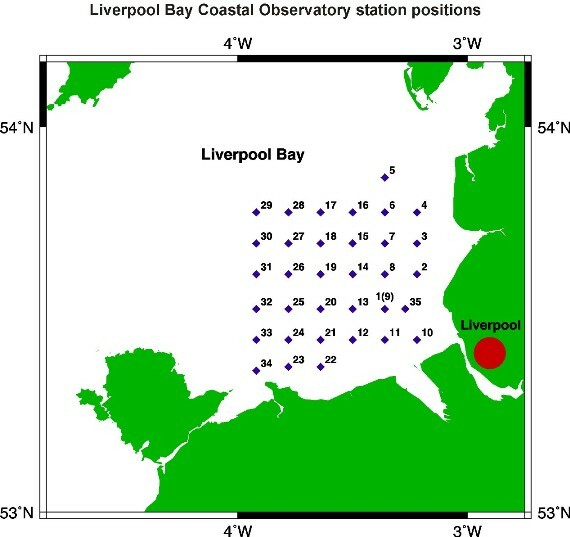 This mooring was deployed in a collaboration between Cefas and the POL Liverpool Bay Coastal Observatory. The rig was deployed in December 2009 during RV Prince Madog cruise PD47/09. The rig was recovered in January 2010 during RV Prince Madog cruisePD02/10. The SmartBuoy carried a suite of Cefas instruments mounted just below the surface, as well as instrumentation belonging to POL upto 15 m deep. Further information is given in the table below. The single point mooring was composed mainly of 0.5 inch long link chain, marked by a 1.8 m diameter toroid and anchored by a half tonne clump of scrap chain.